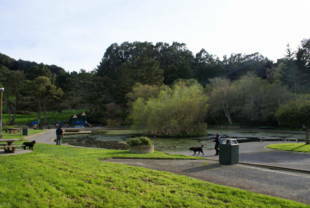 McLaren Park offers a host of recreational amenities to satisfy a variety of appetites in all age groups. Most are situated around the three primary areas: the Louis Sutter Playground, the Herz Playground and the Tennis Complex. Louis Sutter Playground near the corner of University and Woolsey Sts. provides a community clubhouse, 2 baseball diamonds, 2 tennis courts, a full size basketball court, 2 modern play areas for children, a junior soccer field and 16 tables for picnicking. Herz Playground at the corner of Visitacion and Hahn St. provides an indoor swimming pool (Coffman Pool) a full size basketball court, a soccer field, a baseball diamond, 2 tennis courts and a large play area for children. The Tennis Complex located on the crest of the park at Mansell & Visitacion Sts. offers 6 first rate tennis courts. 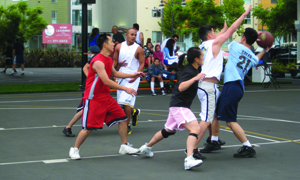 Two additional 1/2 size courts for basketball arel along the north perimeter of the park bounded by Burrows St. 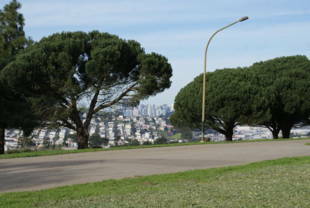 Many people for many years have been using McLaren Park's vast network of trails for hiking, walking and jogging. The system is comprised of 7 miles of improved trails throughout the park and an array of unimproved rock trails on the parks southern slopes. The improved trails, primarily asphalt paved, follow the topography's contour lines with very few having grades exceeding 11%. It is possible to walk completely around the park on the path system. There are also several small trail loops for those who like to take shorter walks or design their own jogging circuits. For those who enjoy staying closer to civilization two bodies of water, the park's reservoir in the north west corner and McNab Lake in the Sutter Playground are bounded by paved paths often used by joggers. It takes five times around McNab to get a mile's worth of exercise, but only 2.3 times around the reservoir to get the same result. Seventy-five tables for picnickers can be found throughout the park. Some are in remote locations for visitors looking for quiet and serenity, while others are located inside the playgrounds. 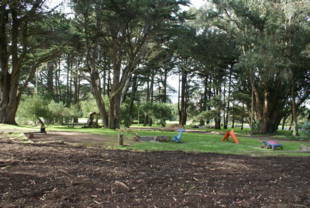 Large parties are provided two large picnic sites at the Group Picnic Area located on the north leg of Shelley Drive. A little known but much prized feature of McLaren Park is the nine hole Glen Eagles Golf Course located along the southern slopes of the park. Managed by a concessionaire, the challenging course has proven to be a great place to practice one game while out of the watchful eye of players on the more well known courses. Entrance to the course is along Sunnydale St. in Visitacion Valley. McLaren Park is owned by the San Francisco Recreation and Park Department. More information, including garden plot availability for the John King Community Garden, is located on the Recreation and Parks Department Urban Agriculture website. Muni: #29-Sunset to Persia Avenue and/or Mansell Street. It was once a rancho. Four years after California was declared a 'free and sovereign State' within the Mexican republic in 1836, Governor Juan Batista Alvarado granted what is now known as McLaren Park to the local government in 1840. Subdivision plans for the land grant were drawn up and in 1905, architect Daniel Burnham, working with the Association for the Improvement and Advancement of San Francisco, introduced his Burnham Plan. It recommended that the hilltops where McLaren and Bayview parks are now located, be reserved for parks. In 1926 the idea took root when the San Francisco Board of Supervisors voted to acquire 550 acres at the McLaren park site for park use. When a bond issue to fund the acquisition was defeated in 1928, the Board reduced the proposal's size and began to purchase land. A view- drive was built in the 1930s. 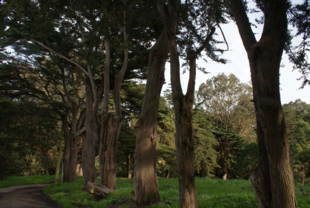 In 1934, John McLaren, the Scottish landscape gardener who was the director of Golden Gate Park, hoisted a dedication flag in the 318- acre park bearing his name. It was the second largest park in the city. The park's first recreation facility - Coffman Pool - was constructed near the Herz Playground in 1958, and the first of the park's four master plans was presented in 1959 by McLaren Park Associates. It called for the creation of additional recreational facilities. Construction, which began in the 1960's, included the Glen Eagles Golf course, the two park lakes, Louis Sutter and Herz Playgrounds, the tennis courts, amphitheater, the Mansfield-Burrows Playground and the Wilde Overlook area with its viewing tower. The landscape was interwoven with new trails, picnic and parking area, community gardens, and irrigation systems. In 1987, voters passed a $2.4 million bond issue for major improvements. The park's 1983 Master Plan was updated in 1988 and, for the last time, in 1996. It called for the development to be phased over a five-to-ten-year period and gave high priority to 'special interest' activity areas. Friends of McLaren Parks' Franco Mancini reports on progress: following a $5000 planning grant, restoration of the Oxford-Bacon pond (officially known as Yosemite Marsh), is now developing the second step -- engineering. The amphitheater renovation has been finished and the theater has been used by several private groups. New paths for the disabled at the Oxford-Bacon recreation area were completed in June. Sutter Playground is undergoing a seven-month, $772,000 restoration that includes renovation of two play areas, construction of barriers to prevent erosion of the hills, paving the gullies feeding into McNab Lake, and dredging McNab Lake. Restoring nature in their park is the focus of the Friends' ongoing activities. They are working with the Recreation and Park Department to replace invasive plants with native species and to develop habitats for the reintroduction of quail (the California state bird), and swallowtail and mission blue butterflies. They have applied to the National Tree Trust for a grant to introduce additional indigenous trees and/or to control non-native species such as the eucalyptus.